Artists Comments: I purchased an e-book from artist Larry Seiller and attempted to paint with a split complimentary pallet. The subject matter in this painting lent itself to the split pallet but, I don't think I really understand the concept. 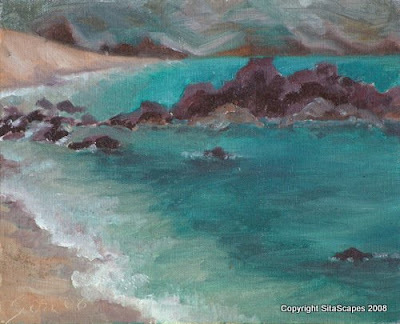 I did learn that mixing a bit of my rock color with the ocean color and applying it on my canvas gave the impression of reef below the water.